Beautiful floor length Tara Keely wedding gown, NEW sample size 12, not altered, never worn, TAGS STILL ON, and protected in a pet-free, smoke-free, temp controlled home and in it's original gown bag. My mother convinced me to purchase this dress months before the wedding, I liked it but it never felt like "my dress". Two weeks before the wedding I ordered the original dress that I loved to wear on my wedding day. I hope someone will enjoy this beautiful dress as "their dress"! It's your day, feel like the beautiful person that you are! 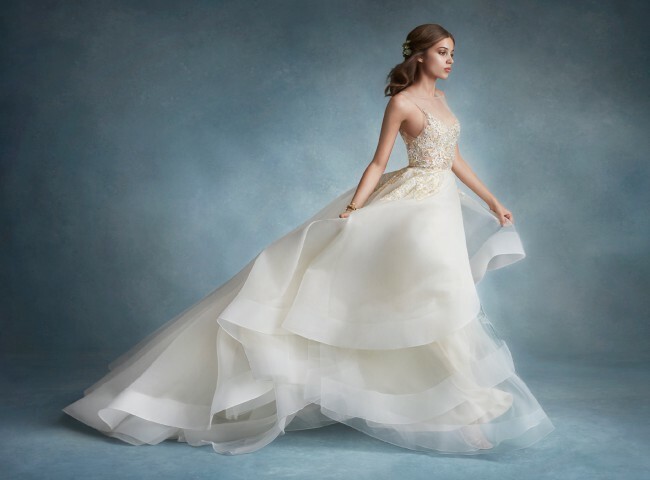 Ivory Gold natural waist organza bridal ball gown, Alencon lace bodice and Illusion scooped neckline, V back with cascading lace detail, Asymmetrical tiered skirt with horsehair trim and chapel train with matching veil. Dress has a delicate gold and ivory detailed top that elegantly flows into a tiered ruffled bottom of dress. Sweeping cathedral length veil touched with delicate flower designs on edges to match details of dress. I originally paid $2900 for the dress and matching veil, but am willing to hear offers! Matching cathedral length veil touched with delicate flower designs on edges to match details of dress.